Last month Mrs. Done by 40 and I realized we had way too many things in the house, and decided to come up with a plan to reduce. We settled on a plan to get rid of thirty things every thirty days, because it seemed more appealing than trying to do one huge purge. And lately I'm trying to think about my behavior largely as a string of habits, rather than a bunch of individual actions that were each intentionally decided upon. So by regularly looking through our possessions, I am trying to form a new habit of taking inventory of the things we have, rediscover the best ones, and then donate or sell the ones we don't use. I walk out to the garage every few days to open a box and take stock. Slowly but surely, we're making progress. (1) DirecTV receiver & (1) remote (When we got a new one they said not to send it back, so we're trying to sell it on Craigslist now). My wife's Jeep was the biggest item and the hardest to part with, as it has some sentimental value and even a name: Shanaynay. She was Mrs. Done by 40's first car, purchased with her own money back in high school. It was the car she learned to drive stick on. 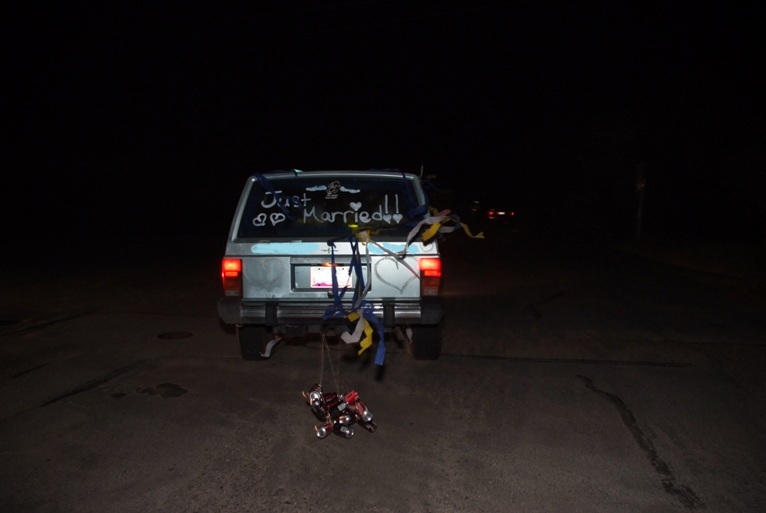 When we drove away from our wedding, it was in Shanaynay, the quirky sky blue Cherokee, cans-a-rattling behind us. She's been a fun & reliable, if somewhat finicky, vehicle over the past decade. Over the past year, the girl who rents our spare room has also been renting our spare car, since we already have too many vehicles and when we do drive a car, it is our Matrix ("Skoda"). Our renter recently asked if we'd be willing to sell Shanaynay to her and after some long talks, we agreed. It was a hard decision but it was the right decision. It's bittersweet to let her go, but the logical side of us know it's just a car. We feel a little better since we're giving her to a friend who doesn't have a vehicle, and someone we know who will take good care of her. So it's time to say so long, Shanaynay. Long may you run. 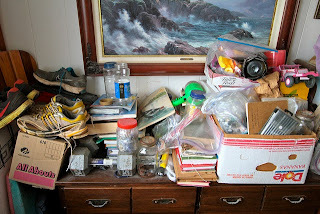 *Photo of clutter is from puuikibeach at Flickr Creative Commons. Did you name the truck from Martin? Now thats classic...lol. Those are the ones that are hard to get rid of. Why not try to sell some of the items on Craigslist and make a few bucks? I need to get rid of some stuff as well but the wifey has a hard time letting things go. If I haven't used it in a few months I ready but she wants to keep them for years. I have try the one thing per day and see how that goes for us. Hi, Thomas. I'm not entirely sure where the name came from -- she named it before we met. I'll have to ask! I'll try to sell any bigger ticket items on Craigslist but if I don't think I can get $10 for something, I usually won't list it. I know I'm leaving some money on the table, but I also like just giving the items away to a good charity. We're not big givers yet and this is one of the areas in which we can give easily, so we take advantage of that opportunity. Yeah I was thinking Shanaynay was from Martin too. I'd love to hear the reason behind that name! haha. I did the opposite recently...I found some books in the trash room of my apartment and picked them. Although in my defense I saw value in them and tried to sell them on Amazon (Bar prep books). I sold one for $140! Can't believe the person just threw it out. But now I have 4 other books that haven't sold and they're taking up room. That's a come up! That $140 already puts you way in the black, even if the others don't net you anything. Great job having such an easy time getting rid of most things you no longer use. I like the concept of doing it a bit at a time. I really need to do something like that! Aw, it is always sad to see cars go for me, even if it's not mine. Cars can be a huge part of your life for better or worse - you spend a lot of time in them! I am glad you were able to see the value in passing it along to your renter. The garage is already looking a little bit more organized so I definitely think it's a worthwhile endeavor, if you have the urge. I agree that letting go of cars is tough, especially ones that have been good to you for so long. But we're good friends with our renter so we'll hopefully get to see Shanaynay for years to come. And thanks for stopping by the blog. I'm heading over to JourneytoSaving now to check yours out, too. Thanks! I like that you guys are getting rid of stuff, and my wife and I also are getting rid of quite a few things recently. We had a garage sale a couple months ago that really helped get the process started, now my wife is on eBay selling stuff and I'm listing some bigger things on Craigslist (and she is too). I feel for you with that car, always hard with the sentimental things. It's cool you have a renter, as we also rent out part of our house. It's been a great setup and we have a new renter moving in mid-August, which gives us a couple weeks to make some needed changes. Good for you two. It's nice to hear from other people trying to earn some income from their primary residence, as it's not all that common. Congrats again on the new renter. I like your idea of de-cluttering bit by bit - it can get very overwhelming when done in one big purge! Agreed! We're eating that elephant one bite at a time. That's a great idea to get rid of clutter! I love the name of your old car. You know I've sold my cars in the past and I always get a bit misty-eyed when I do. There is something about the memories associated with said car that makes you a bit emotional. Nice work, I love a great decluttering story. And it's also about vigilance about what you're bringing in. Papers still are my bugbear! And naturally, a lot are lists! You're absolutely right: the real culprit is the accumulation of things, not retaining them. We'll have to come up with a different approach to deal with that! This is a very cool idea. Decluttering is one of those things I've been wanting to do for a while and just never got around to. Committing to one thing per day is a pretty simple concept that I could definitely see having a big impact over time. Thanks for the idea! Nice work and the 30 days thing is a great idea. I'll have to run this by Mrs. 1500 who has entirely waaaaaaaaaaaaaaaaay too much crap.